Mooooo! Cows are a domesticated farm animal that farmers use for milk and for meat. A baby cow is called a calf. A young female cow is called a heifer. And a male cow is called a bull. A group or herd of cows is usually called cattle. Cattle is left out to graze on grass...this means that they eat the grass. In India, cows are not eaten, as they are supposed to be respected as much as your own mother. On this page, you will find many cow crafts. All you need to make this paper model of a cow is a printer, some paper, and a scissory. 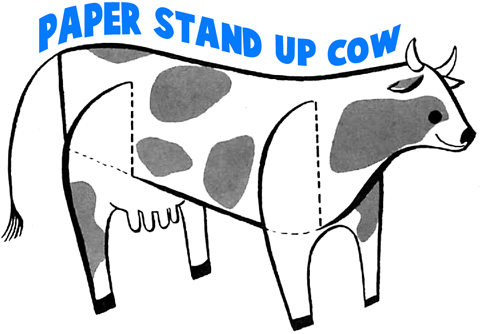 Print out this paper cow diagram here. Now cut out the diagram. Then fold the cow in half. 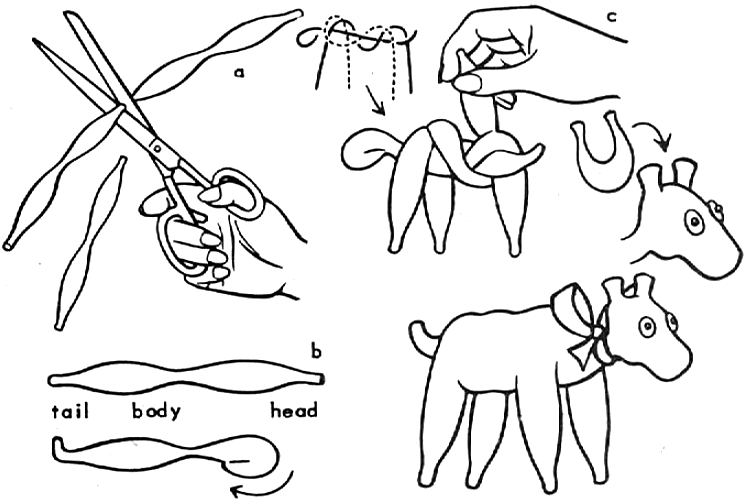 You can either paste the head and tail together or use a paper clip to hold the cow together. You just spread the legs a bit and it stands on its own.Very easy. 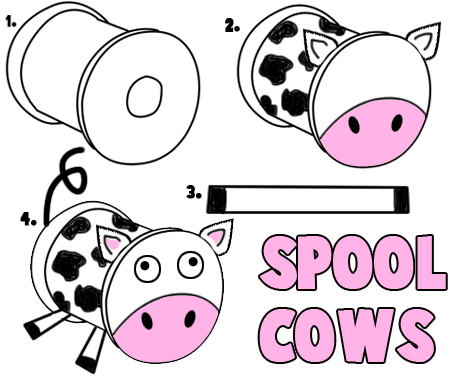 Learn how to make these spool cows with the following craft instructions. Paint a spool white and let completely dry. Then paint black shapes on the cow's body. Let dry. Use either card stock, felt, or crafts foam to cut out some of the following items. Trace the circle part of the spool onto white felt/ card stock/ foam and then cut it out and paste onto the front of the cow for his face. Cut out white leaf shapes and glue to the spool for ears. Paint or use a marker to make the bottom part of the face pink. Then draw on 2 black ovals for nostrils...as seen in figure #2 above. Use white felt/ card stock / foam to make 2 rectangles like the one seen in figure #3. Draw 2 black rectangles on both sides for hooves. Glue googly eyes on spool front (or draw the eyes). Glue legs on bottom of spool. Glue on a pipe cleaner for tail. 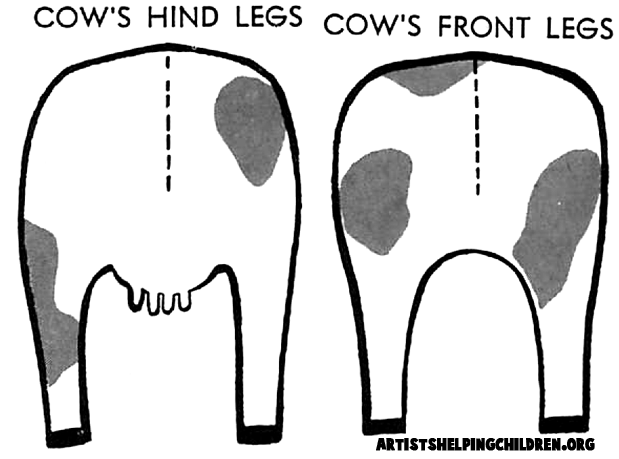 Print out these 2 templates - cow body template and cow leg template Like any 3D paper template, it would work out better if you printed it out on card stock, but this is optional. Then cut the shapes out (you can keep a white outline around the tail ). 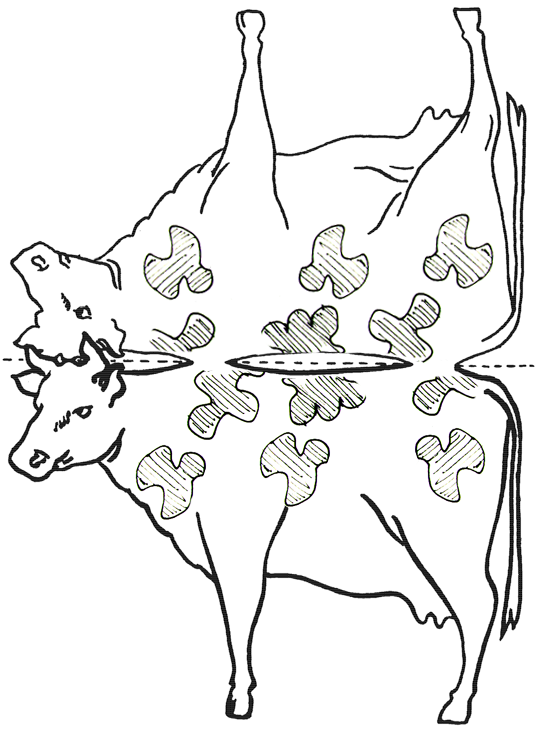 Then cut slits where you see the dotted lines on the cow. Next put the front and back legs into the 2 slits. 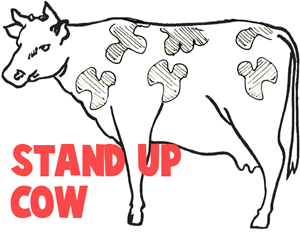 Now the cow should stand up on its own. Click on the above picture to see it larger. These cows are made with a special type of pipe cleaner called Chenille Stem Bumps. They are like pipe cleaners but with varying widths. Cut 2 bumps (from Chenille Stem Bumps) for body and head (sketch a). Fold "head" bump under as shown in sketch b. Cut 2 bumps each for front and back legs. Twist around body so that each pair of leg bumps forms a back and a front leg (sketch c). Bend 1 1/2" length of wire in a U shape and press underneath head, then squeeze into place for ears. Glue sequins to head for eyes. Tie a bow around neck. To make this paper cow mask, just print out the following cow mask template. Learn how to draw cartoon and realistic cows with the above drawing tutorials...just click on the thumbnail that you want to try. Animal Masks for Kids and Ideas with Shoelaces -Here are a few animal mask crafts for children of all ages. Bull, Cow or Ox Paper Bag Puppet Craft - Find out how you can make a cow puppet with your kids using a paper bag. Cowboy on Bulls Halloween Costume Making Activity - Learn how you can make your own cowboy costume with a cow! Cow Crafts to Make- Here is a cute and simple cow craft that children will enjoy making. Cow Door Hanger Craft for Kids - Find out how you can make this adorable cow door hanger with your children. Cow Puppet - Learn how to make a cow puppet using a paper lunch bag. Cow Toy Printable Paper Craft - Print the free cow template and then follow these instructions to put the cow together. Easter Eggs: Purple Cow Egg Crafts - Make a cute purple cow egg using a hard-boiled egg and a few other supplies. How to Fold Origami Cow - A great cow origami model project for children. Number Four Craft : Numbers Crafts for Children - A cow craft that will teach children about the number four. One Very Cool Cow Crafts Projects - A simple cow you can make from a paper cup, white tissue paper, tape, a black pipe cleaner and other materials. Ox or Bull Toilet Paper Roll Craft - Turn a toilet paper roll into a three dimensional bull! Paper Lunch Bag Cow Puppet Craft for Toddlers & Preschoolers - Learn how to make this paper lunch bag cow puppet. 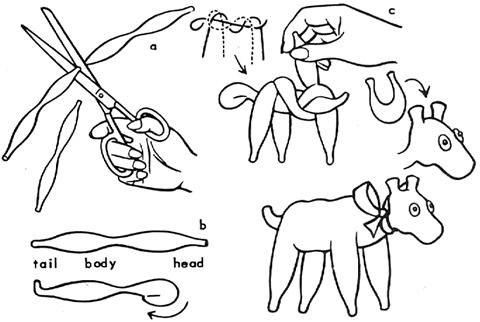 Paul Bunyan Puppet Theatre - Instructions on how to make your own Paul Bunyan puppet theatre. Soda Pop Can Cow- Why not make an entire herd of these tiny cows?! They don't all have to be black and white; you can get creative and make them in many different colors. 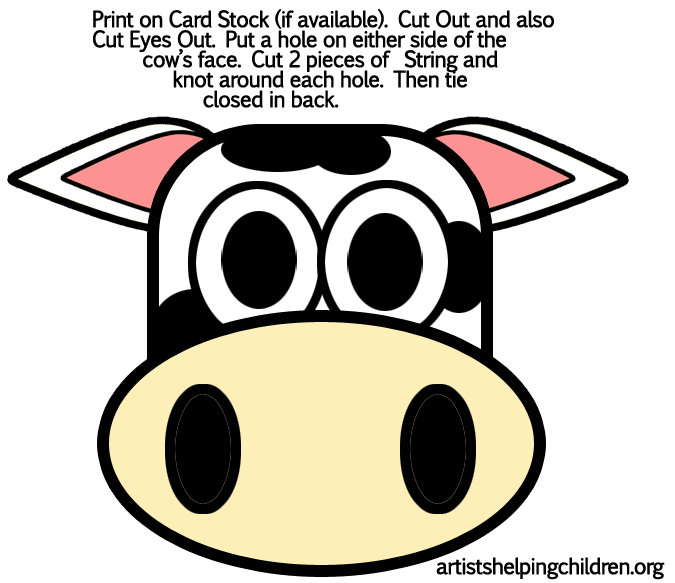 Talking Cow Card Arts and Crafts for Children - Find out how you can make this talking cow card by following these instructions. The Cow Jumped Over the Moon Paper Plate Craft - Make this cool cow craft using a paper plate. Toilet Paper Roll Cow to Make- Find out how you can turn two toilet paper rolls into an amazing cow.